Vatican City, 3 October 2014 (VIS) – A press conference was held this morning in the Holy See Press Office during which Cardinal Lorenzo Baldisseri, secretary general of the Synod of Bishops, outlined the structure of the Extraordinary General Assembly of the Synod of Bishops on the Family, to be inaugurated by the Pope during a solemn mass in St. Peter's Basilica next Sunday. The Cardinal explained that among the 191 Synod Fathers there will be 61 Cardinals, one Cardinal Patriarch, 7 Patriarchs, one major archbishop, 67 metropolitan archbishops, 47 bishops, one auxiliary bishop, 1 priest and 6 religious. There will also be 16 experts, 38 auditors and 8 fraternal delegates. He also remarked that since this assembly will consider the theme of the family, special emphasis has been given to married couples, parents and family heads, a total of 12 persons; there is also one married couple within the group of experts. (Vatican Radio) Pope Francis presided a prayer vigil in St. Peter’s Square on Saturday evening, ahead of the Extraordinary Synod on the Family, which is set to begin on Sunday at the Vatican. The outdoor vigil began at 7 p.m., Rome time, and drew tens of thousands of faithful. During his homily, the Pope asked that the Church pray for the Synod Fathers, in particular for the gift to listen in the manner of God, to have a spirit of openness in discussions and to maintain a fixed gaze on Jesus Christ. (Vatican Radio) Pope Francis urged the Synod Bishops to listen to the Lord’s call to “care for the family” which is “an integral part of His loving plan for humanity”. He spoke this morning during the Opening Mass of the Synod of Bishops in St. Peter’s Basilica. The two week General Assembly will discuss the “The Pastoral Challenges of the Family in the Context of the Evangelization”. Today the prophet Isaiah and the Gospel employ the image of the Lord’s vineyard. The Lord’s vineyard is his “dream”, the plan which he nurtures with all his love, like a farmer who cares for his vineyard. Vines are plants which need much care! God’s “dream” is his people. He planted it and nurtured it with patient and faithful love, so that it can become a holy people, a people which brings forth abundant fruits of justice. (Vatican Radio) Pope Francis has asked for prayers for the bishops who are about to begin work in the two-week Synod of the Family and invited all families to keep a Bible handy in their homes, and read it often. Addressing the crowds gathered in St. Peter’s Square for the Angelus prayer on Sunday, he mentioned the just-celebrated Mass in St. Peter’s Basilica to inaugurate the Extraordinary General Assembly of the Synod of Bishops on the Family. The Pope explained that the bishops have been called to take care and promote the family according to God’s plan, and thus they will meet for two intense weeks of listening and dialogue on the theme “The Pastoral Challenges of the Family within the context of Evangelization”. “For the family to be able to proceed well, with trust and with hope, it must be nurtured by the Word of God” he said. The Extraordinary Synod on the Family which opens next Monday (5-19 October) will end with a “concluding document”, a Relatio Synodi which will be voted on by the Synod Fathers. The document will be sent to the Pope and to Bishops’ Conferences across the world, along with a “short questionnaire”. It is being sent ahead of next year’s Ordinary Synod. The news was announced today by the Synod Secretary, Cardinal Lorenzo Baldisseri, at a press conference in the Vatican. The Tuscan cardinal said he hoped the Synod discussions would be “free”, “peaceful” and “honest”. “The “Relatio Post Disceptationem” produced at the end of the first week will form the basis for the work that will follow in the second week in the “circuli minores” and which the Synod Fathers will examine before the concluding “Relatio Synodi” document is published. This final document will be sent to the Holy Father,” the Tuscan cardinal said. The “Relatio Synodi” differs from the concluding messages usually published at the end of every synodal assembly (this time Cardinal Gianfranco Ravasi has been asked to write the message). It replaces the proposals (“propositiones”) the Synod Fathers usually sent the Pope during these assemblies. “There will be no “propositiones”. The document will be published as one single “propositio”,” Baldisseri explained to journalists. Participants will vote on the text on Saturday 18 October in the afternoon. The vote will be a simple “yes” (“placet”) or “no” (“non placet”) vote, Cardinal Baldisseri explained. Even the reports which single work groups (“circoli minores”) will present at the plenary session will be voted on first. The document “will be published at a suitable moment, one or two days after” the vote. The work of the second assembly – the Ordinary Synod on the Family, scheduled for 2015 – will be based on this document. It will be “sent to Bishops’ Conferences” around the world, so that they can formulate a response and examine the content of the working document. The final document produced at the Extraordinary Synod will be supplemented by a short questionnaire given that the family is a vast subject and there are other issues regarding it that have not been touched yet.” As such, no decisions will be taken at the end of the Extraordinary Synod, which ends on 19 October. Links are provided in the article to follow the event. On Sunday, Pope Francis convenes a special type of meeting of bishops — one held only two other times — meant to start a frank debate about the church’s teachings and practices with which Catholics seem to most disagree, struggle with and ignore: family, marriage and sexuality. Who: The meeting brings together 191 high-level clergy members from around the world, as well as 16 experts and 38 other laypeople who will speak to the bishops. Most of the laypeople are married couples attending to talk about their experiences. One of the couples is Muslim-Catholic. What: During the first week, everyone meets for four hours in the morning and three more in the afternoon. The second week, they will break into smaller groups. How can I follow the event? The Vatican’s press office created a Web site, synod14.vatican.va , where you can watch news conferences. The office says it will send updates through its Twitter feed, @HolySeePress , and is encouraging the many reporters attending the synod to use the hashtag #synod14 . There is also Vatican Radio and Salt and Light TV . And you can keep up with The Washington Post’s coverage on Twitter: @mboorstein. We’ll be writing about this regularly throughout the two weeks. Vatican City, Oct 6, 2014 / 07:45 am (CNA/EWTN News).- During the opening session for the extraordinary synod on the family, Pope Francis told participants not to be afraid of saying what they truly think, and that only by doing this can they reach real conclusions. “You have to say all that which in the Lord you feel you have to say: without human respect, without timidity,” the Pope told synod participants in his Oct. 6 opening remarks. Initiated yesterday with a mass presided over by the pontiff, the Extraordinary Assembly of the Synod of Bishops on the Family reflects on the theme “The pastoral challenges of the family in the context of evangelization,” and was called for by the Pope in order to form a more concrete reflection for the Ordinary Synod to take place in 2015. The synod will conclude with the beatification of Pope Paul VI, institutor of the synod of bishops, by Pope Francis on Oct. 19. “This voice you bring in synodality. It's a great responsibility: to bring the realities and problems of the Church, to help them walk that road that which is the Gospel of the family,” the Pope continued. Cardinal Erdo, who gave the introductory presentation to the Synod’s opening session, stressed changes in the working method of the meeting to better reflect a Church that is listening to the needs of its people. In a departure from tradition, his presentation to the gathering of 253 Synod participants was given in Italian, rather than Latin, and already included some of the ideas circulated by the bishops in response to the questionnaire on the family sent out to dioceses around the world last year. Archbishop Forte, special secretary for the Synod, stressed the continuation of the work started by Pope Paul VI in the immediate aftermath of the Second Vatican Council, to include the voice of all baptised people in the key discussions of the day. He said the bishops are still learning how to do that and he urged all the Synod participants to heed to Pope Francis’ words and to speak honestly and freely, without prejudice or preconceived answers. (Vatican Radio) The Synod is a process, “we should not expect sound bite solutions” to the challenges facing the family in todays’ “secularized culture”, says the Archbishop of Washington DC, Cardinal Donald Wuerl. He was speaking to Vatican Radio on the eve of the first full day of working sessions in the Extra-Ordinary Synod of Bishops on the challenges of the family in the context of evangelization. “The secular world, the secular vision doesn’t have a lot of space for a relationship with God, or a transcendent reality beyond us … that world has created a individualism and a self-referential world that doesn’t leave a lot of space for a healthy marriage and a family life that is going to follow on from that”. Vatican City, 6 October 2014 (VIS) – The “Report prior to discussion” presented this morning by Cardinal Peter Erdo, relator general, introduces the work of the Synod, emphasising the main points in relation to which the discussion of the Assembly should develop. In this sense, it is important to highlight a new element: the report of this Synod Assembly already includes the Synod Fathers' written discourses, sent in advance to the Secretariat General of the Synod, with the aim of responding better to the collegial sense of the Assembly. First and foremost, Cardinal Erdo's report encourages the family to be regarded with hope and mercy, proclaiming its value and beauty as, in spite of the many difficulties, it is not a “model off course”; we live in a world of mere emotions, he continues, in which life “is not a project, but rather a series of moments” and “stable commitment appears formidable” for humanity rendered fragile by individualism. But it is precisely here, faced with these “signs of the times”, that the Gospel of the family offers itself as a remedy, a “true medicine” that is to be proposed by “placing oneself in the corner of those who find it more difficult to recognise and live it”. No, therefore, to “doom and surrender” within the Church. “There exists a clear and broadly shared heritage of faith”. For example, ideological forms such as gender theory or the equality of homosexual unions with marriage between a man and a woman do not find consensus among the majority of Catholics, while marriage and the family are still largely understood as a “patrimony” for humanity, to be protected, promoted and defended. Certainly, among believers doctrine is often little known or practised, but this does not mean that it is under discussion”. This is particularly relevant in relation to the indissolubility of marriage and its sacramental nature among baptised persons. The indissolubility of marriage is not called into question; on the other hand, it is uncontested and for the greater part observed also in the pastoral practice of the Church with those whose marriages have failed and who seek a new beginning. Therefore, not doctrinal, but rather practical questions – inseparable from the truths of faith – are in discussion in this Synod, of an exquisitely pastoral nature”. 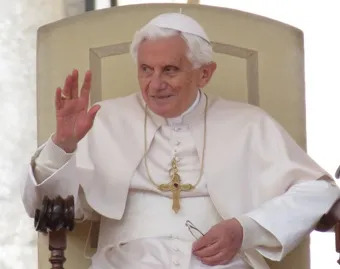 Vatican City, Oct 6, 2014 / 02:22 pm (CNA/EWTN News).- Retired pontiff Benedict XVI may take part to Paul VI's beatification Mass Oct. 19, revealed Father Federico Lombardi, director of the Holy See Press Office. The beatification Mass will take place Oct. 19, at the end of the extraordinary synod on the family – the synod of bishops being an institution the late Pope wanted and promoted. Pope Francis said in an interview with Italian outlet “Corriere della Sera” that Paul VI is one of his models, and he praised his predecessor for the promulgation of the encyclical “Humanae Vitae,” issued notwithstanding the opposing views about its content held by a majority of public opinion. The connection between Paul VI and Benedict XVI, however, is stronger. Paul VI appointed Joseph Ratzinger as archbishop of Munich in 1977, and shortly after created him a cardinal. (Vatican Radio) If we want to give glory to God, we must remember all He has done for us. But that also means remembering our sins. It means being honest with ourselves, said Pope Francis as he reflected on the Readings of the Day during morning Mass at Casa Santa Marta. The Lord "chose his people and accompanied them during their journey in the wilderness, throughout their lives", said Pope Francis commenting on the first reading in which St. Paul recalls his past life, without hiding his sins. What "God did with His people - the Pope said - he has done and continues to do which each of us". The Pope then asked "where we were chosen because Christian, and not that person over there, far away who has never even heard of Jesus Christ?". "It 'a grace," was the Pope’s answer: "A grace of love". (Vatican Radio) At the daily press briefing in the Vatican on Tuesday, journalists heard how bishops meeting on the second full day of the Synod for the Family have been discussing the importance of using more inclusive language to talk about people living outside the teachings of the Church. They’ve also been stressing the need for a ‘gradual’ or ‘stepping stones’ approach to couples, and the recognition that elements of truth also exist in those relationships which do not conform to the Church’s ideal vision of family life. Synod participants have also been underlining the need to apply the so-called ‘law of graduality’ or ‘stepping stones approach’ as they minister to people living in all kinds of relationships that do not conform to the Church’s ideal of marriage and family life. Fr Lombardi used an analogy from the Second Vatican Council which led to profound changes in the Catholic Church’s relations with other Christians and people of other religious traditions. During the Council, bishops agreed that while the fullness of Christ’s Church “subsists” only in the Catholic Church, important elements of truth and holiness also exist in other churches and faith communities. In a similar way, he said, valid and important elements of true love and holiness can also exist in a relationship that does not conform to the full vision of an ideal Catholic marriage. (Vatican Radio) At 9 am this, in the presence of the Holy Father, the third General Congregation of the Extraordinary Synod on the family, was held in the Synod Hall at the Vatican, to continue the general debate. Tuesday’s session entitled: The Gospel of the family and Natural Law and family and vocation of the person in Christ opened with a brief presentation by Cardinal Luis Antonio Tagle, Archbishop of Manila (Philippines), who introduced the testimony of Mr. and Mrs. George Campos, from of Couples for Christ in the Philippines present at the synod as Auditors. The testimony of the married Australian couple has been discussed in various articles. The full testimony is at the link. Held at 4:30 pm today, in the presence of the Holy Father in the Hall of the Synod in the Vatican, was the Second General Congregation of the Extraordinary Synod on the Family. The general debate begins with this Congregation, which is following a thematic order in correspondence with the Parts and Chapters of the Instrumentum laboris. Today’s thematic session: God’s Plan on Marriage and the Family (Part I, chapter 1), and Knowledge of Holy Scripture and of the Teaching on Marriage and the Family (Part I, chapter 2) opened with a brief presentation by the rotating President Delegate, Cardinal Andre Vingt-Trois, Archbishop of Paris, France, who introduced the testimony of spouses Romano and Mavis Pirola, directors of the Australian Catholic Marriage and Family Council, Australia, present at the Synod as Auditors. Here is a translation of the texts. "Based on the premise that the family is the basic unit of human society, the cradle of gratuitous love ... it was reiterated that the family constitutes the future of humanity and must be protected"
" A world worthy of our humanity, image of God, is possible if, on our part as Church and through the Pastoral of the Family, we work in faith and charity to render present the Kingdom of God in the world." At 9 o’clock today, the 3rd General Congregation of the Extraordinary Synod on the Family opened, in the presence of the Holy Father, with the singing of Tierce. Following is a translation of the homily that Cardinal Chibly Langlois, Bishop of Les Cayes, Haiti, gave during the praying of Tierce. "It is necessary to transmit a vision of marriage that does not regard it as a destination, but rather as a path to a higher end, a road towards the growth of the person and of the couple, a source of strength and energy." Below is the Vatican's unofficial translation of the summary of the Third General Congregation of the Synod of Bishops which took place this morning in the Vatican. Testimony Criticized for Presenting Homosexual Relationships as "Models That Can Be Legitimately Chosen"
A testimony given to the Synod on the Family about welcoming homosexual couples has been called "damaging" by a concerned international coalition of pro-family groups. Voice of the Family made the comments following the intervention given yesterday by Ron and Mavis Pirola, one of the married couples chosen to address the Synod on the Family meeting in Rome. In their testimony, the Pirolas said friends of theirs were planning their Christmas family gathering “when their gay son said he wanted to bring his partner home too. They fully believed in the Church’s teachings and they knew their grandchildren would see them welcome the son and his partner into the family. Maria Madise, Voice of the Family’s coordinator, said the ready acceptance of a son and his homosexual lover to a gathering where the grandchildren would welcome them into the family “gives a false lead to families and parishes [which] is no example of love and mercy towards anyone. “The unqualified welcome of homosexual couples into family and parish environments in fact damages everybody, by serving to normalise the disorder of homosexuality. It damages children by presenting homosexual relationships as models which may legimitately be chosen,” Madise continued. Pope Francis appealed for Christian unity on Wednesday pointing out that divisions between Christians of different denominations are hurtful for the Church and for Christ. Speaking to the crowds gathered in St. Peter’s Square for the weekly General Audience, the Pope said that we must not forget that there are many who belong to different confessions who share our faith in Christ. Many of us, even within our Catholic Church – he said – have resigned ourselves to this division that has often been cause of conflict, suffering and even wars throughout the course of history. Divisions between Christians – the Pope continued – wound the Church and wound Christ. The Church – he said – is the body and Christ is the head. He pointed out that divisions between Christ’s followers are clearly contrary to his will, as expressed in his prayer to the Father that all might be one, so that the world might believe (cf. Jn 17:21). (Vatican Radio) The breakdown in marriage and family life, particularly in Western culture is not the result of “a crisis of truth, but rather as a crisis of methodology” and the “pastoral programs that attempt to address the negative issues impacting marriage and family life” fail to meet “the magnitude of the cultural challenges facing us today”. This is according to Jeffery and Alice Heinzen who are from the diocese of Le Crosse, Wisconsin USA, were asked to address the second part of the Synod’s working document, the Instrumentum laboris, namely, “The Pastoral Program for the Family in Light of New Challenges”. In their testimony, the Heinzin’s spoke of how the breakdown in family life is impacting in the handing down of the faith between generations. They said that where once the home was the domestic Church and the parent the primary educator in the faith – this is no longer the case.